Providing both a road map and a toolbox, this is a hands-on reference for medical device product development practitioners, product/service development engineers and architects, DFSS and Six Sigma trainees and trainers, middle management, engineering team leaders, quality engineers and quality consultants, and graduate students in biomedical engineering. Khalid S. Mekki is a Quality Manager at Baxter Healthcare Corporation, where he has served in various capacities since 2001. He is working toward his PhD in industrial engineering at the University of Illinois at Chicago. Khalid holds a master's degree in mechanical/quality engineering and a bachelor's degree in mechanical engineering. He has led and completed numerous Design for Six Sigma projects. 1 Medical Device Design Quality. 1.2 The Essence of Quality. 1.3 Quality Operating System and the Device Life Cycle. 1.5 Business Excellence: A Value Proposition. 2 Design for Six Sigma and Medical Device Regulation. 2.2 Global Perspective on Medical Device Regulations. 2.3 Medical Device Classifi cation. 2.5 Medical Device Quality Management Systems Requirements. 2.6 Medical Device Regulation Throughout the Product Development Life Cycle. 3.3 Methods of Input and Output Analysis. 3.6 Normal Distribution and Normality Assumption. 4 The Six Sigma Process. 4.6 Process Capability and Six Sigma Process Performance. 4.7 Overview of Six Sigma Improvement. 4.8 Six Sigma Gose Upstream: Design for Six Sigma. 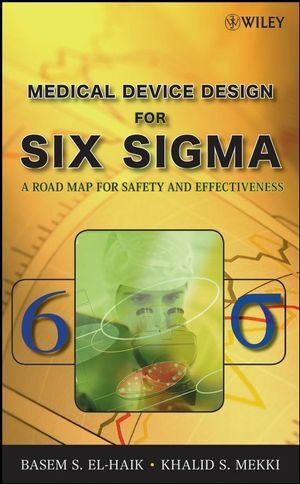 5 Medical Device Design for Six Sigma. 5.2 Value of Designing for Six Sigma. 5.3 Medical Device DFSS Fundamentals. 5.4 The ICOV Process in Design. 5.5 The ICOV Process in Product Development. 6 Medical Device DFSS Deployment. 6.2 Medical Device DFSS Deployment Fundamentals. 6.7 Black Belts and the DFSS Team: Cultural Change. 7 Medical Device DFSS Project Road Map. 7.2 Medical Device DFSS Team. 7.3 Medical Device DFSS Road Map. 7.4 Software DFSS ICOV Process. 8.6 HQQ 1: The Customer’s House. 8.7 HQQ 2: Translation House. 8.8 HQQ 3: Design House. 8.9 HQQ 4: Process House. 9 DFSS Axiomatic Design Method. 9.3 Introduction to Axiom 1. 9.4 Introduction to Axiom 2. 9.5 Axiomatic Design Theorems and Corollaries. 9.6 Application: Medication Mixing Machine. 9.7 Application: Axiomatic Design Applied to Design Controls. 10 DFSS Innovation for Medical Devices. 10.2 History of the Theory of Inventive Problem Solving. 10.6 Building Suffi cient Functions. 10.9 Detection and Measurement Concepts. 10.10 TRIZ Root Cause Analysis. 10.11 Evolution trends in Technological Systems. 10.12 TRIZ Functional Analysis and Analogy. 10.13 Application: Using Triads to Predict and Conceive Next-Generation Products. 11 DFSS Risk Management Process. 11.2 Planning for Risk Management Activities in Design and Development. Appendix 11A: Robust Design Failure Mode and Effects Analysis. 11A.2 Robust Design FMEA Elements. 12 Medical Device Design for X. 12.4 Design for Manufacture and Design for Assembly. 13 DFSS Transfer Function and Scorecards. 13.3 Design Scorecards and the Transfer Function. 13.5 Transfer Function and Optimization. 14 Fundamentals of Experimental Design. 14.2 Classical Design of Experiments. 14.5 2k Full Factorial Designs. 14A.1 Diagnostic Plots of Residuals. 14A.2 Pareto Chart of Effects. 14A.3 Square and Cube Plots. 15 Robust Parameter Design for Medical Devices. 16 Medical Device Tolerance Design. 16.2 Tolerance Design and DFSS. 16.5 Taguchi’s Loss Function and Safety Tolerance Design. 16.6 High- vs. Low-Level Requirements’ Tolerance Relationships. 16.7 Taguchi’s Tolerance Design Experiment. 17 Medical Device DFSS Verifi cation and Validation. 17.2 Design Verifi cation Process. 18.6 Advanced Product Quality Planning. 19 Design Change Control, Design Review, and Design History File. 19.2 Design Change Control Process. 20 Medical Device DFSS Case Study.